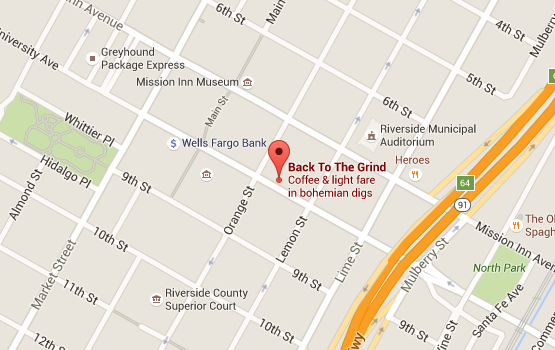 Whether you're coming to check out a local band, hear a poet give a reading or host an event for your ogranization, the best place to do it is at Back to the Grind. The premier entertainment spot in downtown Riverside. In the mood for an espresso? How about a protein smoothie and a turkey sandwich? Black coffee and a vegan donut? All of the above? Whether it's a cup of coffee, a tea latte or a vegan pizza, there's no wrong decision here. We're proud of all the events we've hosted here, whether it's a wedding, a fresh new band, or Ground Zero for the Riverside Artswalk. We've been hosting events for over 20 years! Take a peek at our photo gallery to share the memories. Back to the Grind offers a hip, open air venue for bands, weddings, event hosting, art shows & open mic nights. Want to show your support for this Riverside institution? Click the button below to order a fabulous Back to the Grind t-Shirt! Reservations: Email us here to learn about reserving B2tG! Bulk Orders: Drop us a line about ordering in bulk! Website Issues: Talk to Eric if the site is giving you issues or you want one of your own!